Imagine you are getting married (again). How different do you think the planning experience would be utilising social media? Peter from SiteMost mentioned to me yesterday that he’s working on a new site that’s due to be released early next year. It’s an Aussie website called Hope and Honey, and is aimed at women who are getting married. 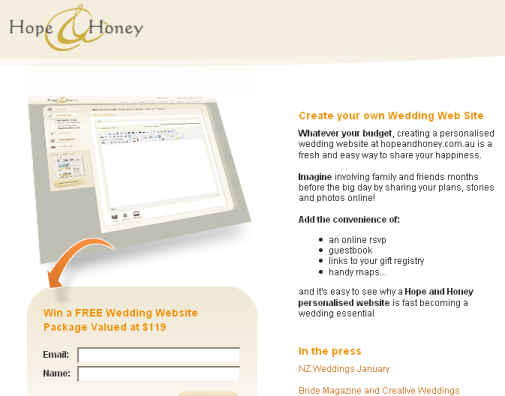 On Hope and Honey, you can create your own wedding website to keep yourself organised and keep everyone up to date with wedding preparations. Included is a blog, online rsvp (including meal choice and special dietary needs), links to gift registries, guest list management , maps to venues, guestbook and photos. I understand there will be an interface whereby the guest information can be exported for easy reference. Leading up to the official site launch, Hope and Honey are giving brides-to-be the chance to win a free wedding website package valued at $119. Simply visit the website and enter your details to be in the draw. I have two relatives who are planning to get married in the next year or so. For someone unfamiliar with a blogging platform, I could see the appeal to having a specific purpose wedding website. My hesitation is that we have created a web culture of “free”, and I think brides-to-be might baulk at having to pay $119 for this service (if that is indeed the price they plan to charge). I asked one of the brides-to-be if they would use the service. She replied, “if I had time, sure I would”. When I asked if she’d pay $119 for the service, she replied “no – maybe $40 or $50”. Of course, the challenge with any new website is getting traffic, and informing people about your service. The wedding industry is certainly a competitive one. Anyone who’s ever had experience in building a website will know, it’s not just a matter of “build it and they will come”. Building a website is the easy bit. Marketing it is the real challenge. What do you think about the concept? The pricing? Disclaimer: NO remuneration was received for this review. I really like the idea of wedding blogs, have seen a few really great ones around. All the details of the day, maps, accommodation etc. And sharing some of your preparations with your guests as well as keeping it for your our memories. Then you can show off all your pictures and stuff when your done. I guess it would depend on what the finished product looked like and the details, to say if people would be willing to pay that much. It’s a little like those baby sites (not that I would use one of those paid or free) But I don’t think any of the paid ones have really taken off much. A friend of mine wanted a website for her wedding as it was going to be quite different from the norm. After she got quote from the web dev, it was well over $119. She ended up getting a family friend to do complete the site & host it. It didn’t give the feeling of the impeding wedding or look terribly polished. I would definitely have a website (and blog) for my wedding. It will give our guests (local, interstate & overseas) specific details of the wedding & what’s involved. Our ideal wedding is more of a weekend rather than a day, which will take some planning. I haven’t ever planned a wedding, but in the entire scheme of things, $119 isn’t that expensive. If people can send their RSVPs, get maps (instead of having to put them in the invite) and feel involved in your day. I’m almost in the position of Leigh, I’ve been with my significant other for over 8 years now. Here’s hoping I won’t have to wait for the 11 year mark! They ARE a great idea, but when you add $119 to a list of expenses, I’d make do with creating my own freebie one. Thankfully I’m not getting married anytime soon, so I don’t have to worry! I did a wedding blog – on blogspot for free. Our guests and family loved it. It was a closed blog, only open to those invited because I had lots of very personal details, photos and names of all my kids. We got married in place where everybody had to travel to, stay overnight and pick the activities they wanted to participate in. The wedding lasted the weekend so we needed to know how many for lunch, dinner, breakfast, cabins, dorms, bus trip to the glow worms, flying fox, mud slide, archery, etc, etc. Doing it all on a blog saved me enormous expenditure and admin time. I also posted some of the wedding photos so that guests could have a quick look. I would pay for it but only if I didn’t know I could do it for free. The drawback was guests who knew nothing about blog navigation (for example, blogspot doesn’t have a home tab, you have to know to click the blog title to return to home page). I would send a link by email and guests would view only that page, rather than go further into links, or click on maps to see a larger version, etc. We really need a facility to teach Aussies how to read and use blogs. I’m working on it for people in Cairns. The relationship that I’ve started to embark on now is with a highly technically competent lady – we both contribute to multiple blogs (a mutual attraction that is no surprise to some) so if (and it is an incredibly big if, given the newness of the relationship) she and I were to tie the knot one day, we’d probably run our own wedding blog, and get some professional graphic design help from friends. But we’re not a typical couple. PS: You could use the same concept (build your own cool custom slick site) for dLook’s business directory as a value-add and link collection point – imagine allowing people to build the equivalent of a Squidoo Lens for their business and own that industry vertical/location space within dLook. Just a thought. Sounds like it worked really well for you. I agree with the password protection, I would imagine the option to set these websites to private would be a useful addition for this service too. Hope your “how to blog” evening went well. I do think they’ve got a nice set of templates planned. I do think that for the computer savy $119 might be more than they are willing to pay when there are cheaper alternatives around like blogspot, wordpress etc. But for the less computer savy and for people that don’t want to stuff around with photos hosted in one place and the blog in another i guess it could just be a winner. But I guess with the free wedding website builders around like Wedding Announcer, brides are not seeking out a paid service as much anymore. It pretty much builds the site for you, all you do is pick a theme and insert text I think.